A beautiful and historically accurate Victorian doll’s house to build from slot-together foamboard pieces, with Victorian furniture for every room and a family of four and their pets. Children will love setting up the table and chairs in the formal dining room, installing the grand roll-top bath and spotting the tiny doll’s house in the nursery. Includes a book about life in a grand Victorian house, showing how a Victorian family lived. A gorgeous gift for Christmas - all the fun of a traditional doll’s house without the high price tag and fiddly assembly. A brilliant idea for anyone who longs for a home for their dolls: a slot-together model to build with a book offering a fascinating look at life in Victorian times. 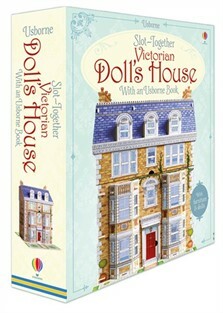 Children will love building this historically accurate Victorian doll's house in easy slot-together foam board pieces. Comes with furniture (even a tiny doll's house in the nursery), a family of four and their pets plus a book about life in a grand Victorian house. together the pieces to create a stunning doll’s house. This toy works on many levels. It’s a craft project for parent’s to build with kids; there’s the play element once it’s complete; and the informative historic detail in the books whisks readers back to a bygone age. Build a historically accurate Victorian doll's house, complete with furniture, home accessories and a family of dolls. I know I would have loved this as a child! All the fun of a real dolls' house without the price tag. As someone who was never able to have a Doll's House as a child this saw all my childhood dreams come true. At last I have a beautiful house which even with my poor eyesight and arthritic 72 year old fingers was able to put together. I am looking forward to many happy hours playing with it. I would hope for further versions - houses through the ages perhaps? This is a beautifully presented set that was a ton of fun to put together and learn about with my 4yo. I did the building and she had a blast putting the people in the house, arranging furniture, and making up stories. The artwork is amazingly detailed. This is a brilliant find for any young girl. A refreshing break from all things computerised. My eight year old granddaughter and her aunt plus myself were enthralled with this, easy enough to put together and a treat to play with using your own imagination. Brings me back to my childhood playing with paper dolls, but this is far better quality.